Head to the great outdoors this long weekend by going on a glamourous camping (glamping) trip with friends or family with Lifestyle in Nurture Wellness Village, Tagaytay on November 28-30. Before December rolls in, enjoy three days of ultimate pampering via “Glamping by Lifestyle: Pitch 2” and get ready to live the luxe-camper life with butler service, sumptuous and healthy full-board buffet meals, yoga sessions, mandala workshops, massage spa treatments, and acoustic sessions. 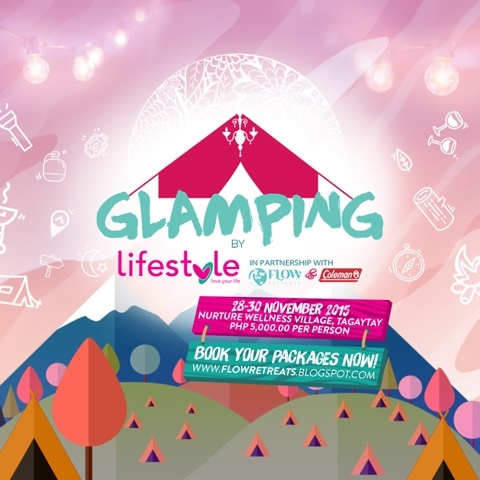 This is the second glamping event of Lifestyle this year. Last April, it successfully had the first beach glamping event in the country in Crystal Beach Resort, Zambales during the Summer Siren Festival. Book your long weekend viaflowretreats.blogspot.com and have a glam and green holiday with “Glamping by Lifestyle: Pitch 2.” Few slots are remaining. “Glamping by Lifestyle: Pitch 2” is a project of Lifestyle, the premiere cable channel and must-go lifestyle hub of modern and young Filipinos in partnership with Flow Retreats and Coleman.